A film harking back to the days of early cinema. The black and white flicker of 35mm grain softening expertly lit scenes, in which actors perform in period costume on a sound stage. Independencia (2009) creates both an obvious artificiality, and an authentic nostalgia. Developed through the Résidence du Festival de Cannes in 2008 Raya Martin’s exquisite film positions a history of Philippine autonomy – or lack thereof – alongside a history of cinema, presenting a fable of familial survival as an image as questionable as that of propagandist ethnographic ‘news’. Set at the outset of the invasion by US forces in the Philippines in the early 20th century, a mother (Tetchie Agbayani) and adult son (Sid Lucero) escape to the jungle to begin a new life. Eventually the son discovers a lone, pregnant woman in the jungle too (Alessandra de Rossi), and as time passes, the trio changes from a mother, son and ‘daughter’ of sorts, to a mother and father and young son. 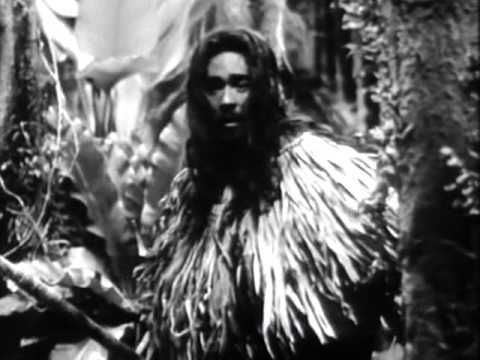 Learning to hunt for survival is the first struggle to overcome, and the son’s transformation from a naïve but enthusiastic adventurer to a skilled hunter and father is signalled both by Lucero’s performance, which gradually becomes more assured in his environment, and by a closer physical assimilation with the forest. Martin’s overall aesthetic is one of a highly sensitive attention to detail, as, though it is obvious from the start that the environments are fabricated, the painted backdrops are but one element of the cinematic world Independencia consists of. Ronald de Asis’ and Arnel Labayo’s sound design evokes the claustrophobic heat of a dense, rural habitat, whilst Digo Ricio’s production brings the natural world to life through authentic sets that include the presence of birds and smaller animals. 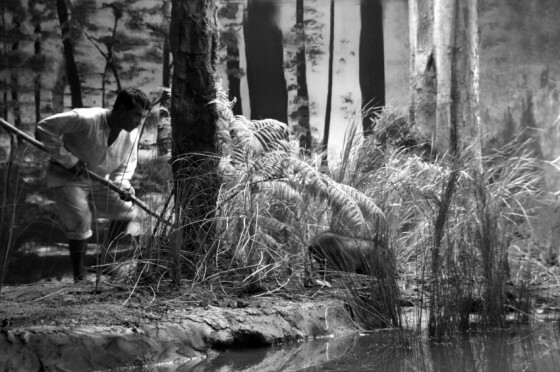 Lutgardo Labad’s pastoral score provides an underlying romantic melancholy, which, combined with Jeanne Lapoirie’s charcoal toned cinematography, results in a film that seems to encase its characters in the image that it presents; they move from one lush forest scene to another, as though within an unending, unambiguously cinematic loop. 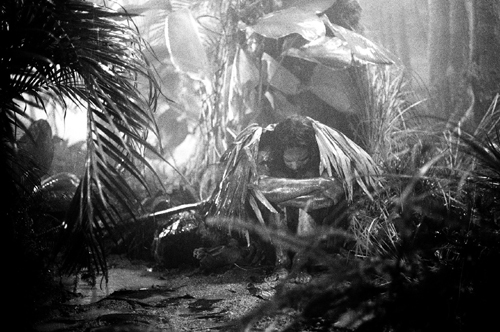 Though they have come to the jungle to for freedom, their boundaries are just as limited as those who remained in the town, and are defined by the film’s own construction. Alongside the new, beautiful digital transfer of the film that Second Run have released is a new short film, Track Projections by Raya Martin, which flips the image of a digitally shot, rolling landscape from a train window on its side, thereby making the image akin to the cinematic reel, abstracting the reflection in what might be considered a reference to Stan Brakhage, who the director has previously cited as an influence. This new short again demonstrates the director’s concern with the meaning of cinema – made most explicitly in his recent collaboration with Mark Peranson, La última pelicula (2013) – and the particularity of the filmic image in the digital age. This is very good â if I hadnât cancelled Lovefilm, I might have ordered it. Look forward to chatting later, hope you have a good day.